To determine the risk factors for re-treatment following LASIK in hyperopic eyes. In this retrospective study, consecutive hyperopic eyes underwent LASIK at the Care Vision Laser Centers, Tel-Aviv, Israel, between January 2000 and October 2014. Patients were divided into two groups according to whether or not they underwent additional refractive surgery (re-treatment). Logistic regression was performed to determine predictors of re-treatment. Overall, 1,776 eyes of 888 patients were included, of which 82 (4.6%) needed re-treatment. Eyes that underwent re-treatment were of older age (49.1 ± 7.5 vs 46.9 ± 10.3 years, P = .01), had better preoperative CDVA (1.0 ± 0.14 vs 0.95 ± 0.15 decimal, P = .001), were treated more often with the Allegretto EX200 (Alcon Laboratories, Inc., Fort Worth, TX) as opposed to the EX-500 (90.2% vs 63.7%, P < .001), and were treated with a Moria M2-90 microkeratome (Moria S.A., Antony, France) as opposed to Moria SBK-90 (66.7% vs 36.4%, P < .001). Multiple logistic regresison analysis demonstrated that treatment with Allegretto EX200 (odds ratio: 2.67, P = .04), and Moria M2-90 microkeratome (odds ratio: 2.23, P = .04) and older age (odds ratio: 1.03, P = .03) were significant risk factors for re-treatment. Factors associated with a higher risk of re-treatment following hyperopic LASIK include type of laser, type of microkeratome used, and older age. Identifying such factors may aid in reducing future retreatment rates in hyperopic LASIK. Higher initial corrections, astigmatism, and older age have been reported to be significant risk factors for LASIK retreatment.2–4 Previous studies have reported results and risk factors for re-treatment following LASIK, primarily in myopic eyes. However, the principle behind hyperopic LASIK differs greatly from that of myopic LASIK. The purpose of the former is to achieve ablation of an annular zone to cause a relative flattening of the corneal periphery and a concomitant relative steepening of the center, the optic zone. In the latter, the surgical thinning takes places in the center of the visual axis, reducing the corneal dioptric power. A paucity of data exists regarding the risk factors that predict the need for re-treatment and the rate of re-treatment following hyperopic LASIK. The aim of this study was to identify factors that may predict the need for re-treatment following hyperopic LASIK. Institutional review board approval was obtained from the Barzilai Medical Center, Ashkelon, Israel, and all data for the study were collected and analyzed in accordance with the policies and procedures of the institutional review board and the tenets of the Declaration of Helsinki. This retrospective study included hyperopic patients who underwent LASIK by one of five experienced surgeons between January 2000 and December 2014 at Care Vision Laser Centers, Tel-Aviv, Israel. Inclusion criteria were age older than 18 years, a stable refraction for at least 12 months, intraocular pressure less than 21 mm Hg, a period without wearing contact lenses (more than 2 weeks for rigid contact lenses and more than 4 days for soft contact lenses), and no history of autoimmune disease, diabetes mellitus, or previous ocular surgery. The medical files of all eligible patients were reviewed and the following demographic and preoperative information was extracted: age, gender, date of surgery, central corneal thickness measured by ultrasonic pachymetry (Sonomed Escalon, Stoneham, MA), mesopic pupil diameter, preoperative sphere, preoperative spherical equivalence, preoperative astigmatism, corrected (CDVA) and uncorrected (UDVA) visual acuity. The following intraoperative information was extracted: operating room humidity, operating room temperature, microkeratome used (Moria M2-90 vs Moria SBK-90; Moria, Antony, France), intraoperative flap thickness, optic zone, laser type (Allegretto EX200 vs EX500, Alcon Laboratories, Inc., Fort Worth, TX), involved eye (right or left) and the identity of the surgeon. The Moria M2-90 microkeratome and EX200 laser were used in early study years and were replaced by the Moria SBK microkeratome and EX500 laser, respectively. All patients underwent the following detailed LASIK procedure. One drop of a topical anesthetic (benoxinate hydrochloride 0.4%) was instilled in the conjunctival fornix of the eye prior to surgery, after which an eyelid speculum was inserted. After the creation of a corneal flap, the stromal bed was ablated using one of two excimer lasers, Allegretto EX200 or EX500. A balanced salt solution was used for irrigation before the flap was reinstated. Following surgery, patients were prescribed moxifloxacin 0.5% (four times a day), dexamethasone 0.1% (two or four times a day) for 1 week, and artificial tears (four times a day) for as long as needed. Patients were routinely examined at 1 day, 1 week, and 1, 3, and 6 months postoperatively and more if necessary. Patients were encouraged to return for examination if vision deteriorated at any time after surgery and laser enhancement procedures were offered free of charge following surgery. In general, the routine in our center is to consider enhancement for unsatisfied and suitable patients if the refraction is at least 0.75 diopters (D) with a UDVA of 0.80 (decimal, Snellen 20/25) after 4 months following primary treatment. Data were analyzed with the Minitab software (version 16; Minitab Inc., State College, PA). The Student's t test was used and one-way analysis of variance was used for the analysis of continuous data for comparison of multiple group averages. All presented means are accompanied by their respective standard deviations. For the analysis of categorical variables, the chi-square or Fisher's exact test were used and and odds ratio values were calculated when applicable. A multiple binary logistic regression analysis was performed in an attempt to determine predictors of need for re-treatment. For this purpose, independent variables that reached a significance level of less than 0.1 in univariate analysis were included. Because the chance of needing re-treatment is directly affected by follow-up time, the year of primary treatment was taken into consideration as a potential confounder. In all analyses, a two-sided P value of less than .05 was considered statistically significant. Overall, 1,776 eyes of 888 patients were included in the final analysis of this study. The mean age of the participants was 46.8 ± 10.8 years (range: 18 to 60 years) and 51% were male. The percent of patients observed for at least 1 week and 1, 3, and 6 months postoperatively was 98.1%, 89.9%, 50.8%, and 38.0%, respectively. A total of 82 eyes (4.6%) underwent retreatment surgery 675 ± 579 days following surgery. None underwent more than one enhancement. 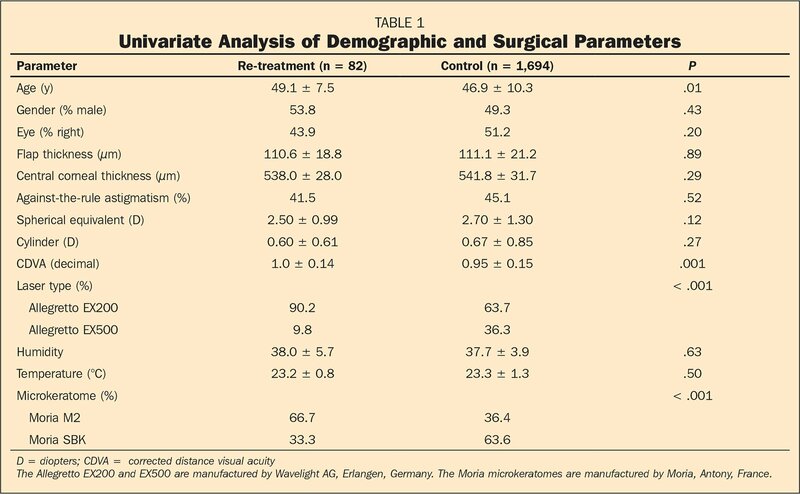 Table 1 depicts the results of the univariate analysis when comparing demographic, preoperative, and intraoperative parameters of the re-treatment and control groups and their calculated P values. Briefly, the re-treatment group was significantly older (49.1 ± 7.5 vs 46.9 ± 10.3 years, P = .01) (Figure 1), had better preoperative CDVA (1.0 ± 0.14 vs 0.95 ± 0.15 decimal, P < .001) (Figure 2), was made up of a higher proportion of patients operated on with the Allegretto laser EX200 (as opposed to EX500) (90.2% vs 63.7%, P < .001), and a higher proportion of patients operated on with a Moria M2-90 microkeratome (as opposed to Moria SBK-90) (66.7% vs 36.4%, P < .001). There was a non-significant trend toward differences in terms of optic zone (P = .10) (Figure 3). Re-treatment rate as predicted by age of patient. 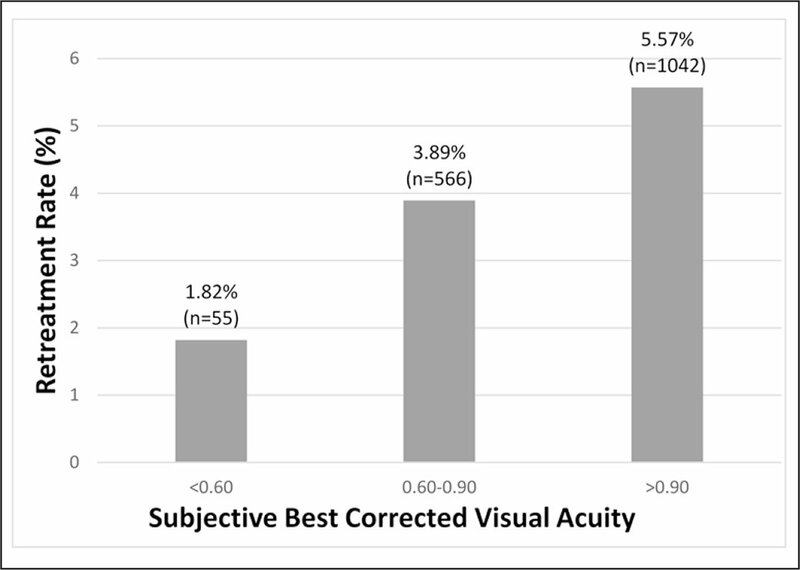 Re-treatment rate as predicted by preoperative best corrected visual acuity. Re-treatment rate as predicted by size of optic zone. 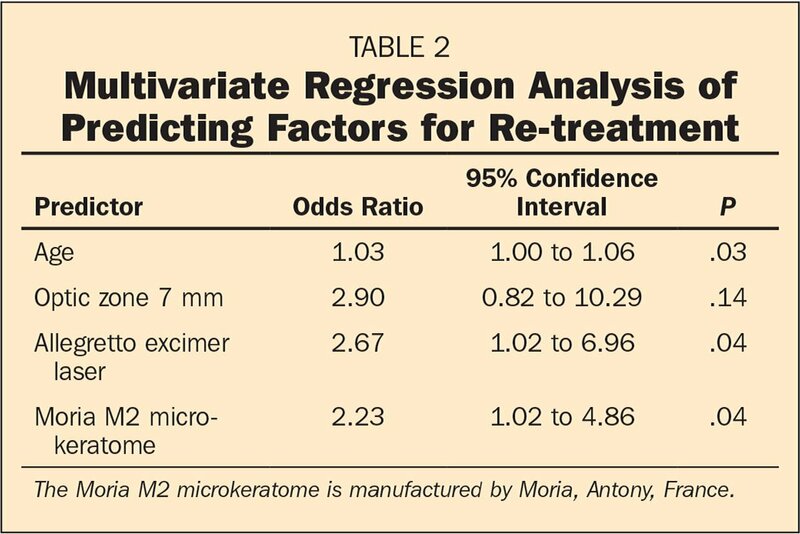 Using multiple logistic regression analysis, the factors predicting an increased likelihood of re-treatment are listed in Table 2. Briefly, use of the EX200 laser (as opposed to the EX500 laser) (odds ratio: 2.67, P = .04), use of the Moria M2-90 microkeratome (as opposed to the Moria SBK-90 microkeratome) (odds ratio: 2.23, P = .04), and older age (odds ratio: 1.03, P = .03) were significant independent predictors of a need for retreatment. However, as discussed by O'Brart,13 the larger the optic zone, the more irregular the delivery of the treatment among the corneal surface for a given generation of technology. 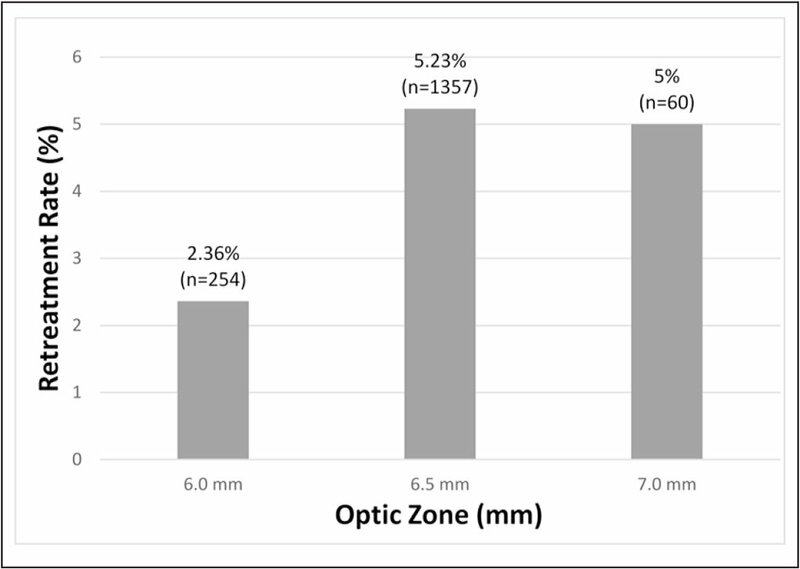 According to the findings of Davidorf et al.,6 this effect and the higher likelihood for over-correction as optic zone increases can serve as an explanation for the decrease in first treatment success index as measured by re-treatment for an optic zone of 7 mm as compared to 6.5 mm. On the other hand, a larger optic zone could potentially deliver treatment on the flap hinge, increasing the likelihood for irregular astigmatism. In this study, the use of a Moria M2-90 microkeratome (as opposed to Moria SBK-90) was associated with a higher re-treatment rate. Indeed, the Moria M2-90 has been reported to create thicker flaps with a higher variation when compared to the Moria SBK-90.15 We speculate that the older microkeratome may also be associated with worse flap alignment, exposing the flap to epithelial ingrowth and general flap misalignment, all of which may contribute to more aberrations and greater sensitivity to small refractive changes later on. In this study, there was an association between older age and re-treatment. 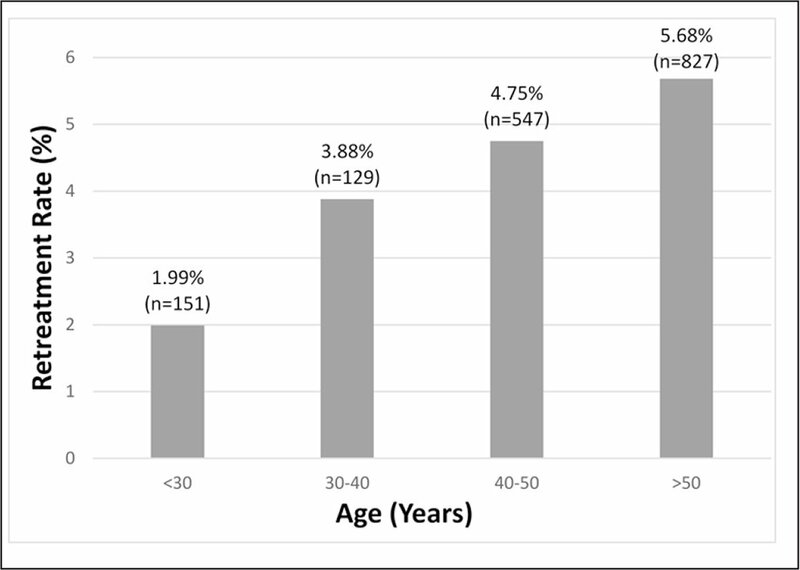 It is likely that given the age of this group (46.8 ± 10.8 years), older patients were more susceptible to pre-cataract lenticular refractive changes. As such, this finding emphasizes the notion of discussing the effect of lenticular refractive changes, specifically in hyperopic patients undergoing refractive surgery, who are often indeed older. A factor that was significant in univariate analysis only was preoperative CDVA, which was better in the re-treatment group. We speculate that patients with a higher preoperative CDVA have higher expectations and are therefore more likely to seek emmetropic outcomes. As such, it may be prudent to thoroughly discuss expectations in this group of patients. This study had several limitations, the first of which is its retrospective nature. In addition, we did not examine alternate outcomes for measuring the success of the procedure such as efficacy and safety index and chose to focus on re-treatment only as a surrogate for success of treatment. Additionally, subjective quality of vision was not assessed in our study, making it possible for multiple higher order aberrations to affect the rate of retreatment without us directly measuring it. Finally, the inclusion of both eyes of each patient in the analysis may have led to a source of bias when interpreting the results because there is an intra-individual correlation in terms of risk of enhancement. Perlman EM, Reinert SE. Factors influencing the need for enhancement after laser in situ keratomileusis. J Refract Surg. 2004;20:783–789. Randleman JB, White AJ, Stulting RD. Incidence, outcomes, and risk factors for enhancement after wavefront-optimized advanced surface ablation and laser in situ keratomileusis. J Refract Surg. 2009;25:273–276. Arbelaez MC, Knorz MC. Laser in situ keratomileusis for hyeropia and hyperopic astigmatism. J Refract Surg. 1999;15:406–414. Zaldivar R, Oscherow S, Bains HS. Five techniques for improving outcomes of hyperopic LASIK. J Refract Surg. 2005;21:S628–S632. Kermani O, Schmeidt K, Oberheide U, Gerten G. Hyperopic laser in situ keratomileusis with 5.5-, 6.5-, and 7.0-mm optical zones. J Refract Surg. 2005;21:52–58. Davidorf JM, Zaldivar R, Oscherow S. Results and complications of laser in situ keratomileusis by experienced surgeons. J Refract Surg. 1998;14:114–122. Iseli HP, Mrochen M, Hafezi F, Seller T. Clinical photoablation with a 500-Hz scanning spot excimer laser. J Refract Surg. 2004;20:831–834. From the Department of Ophthalmology, Rambam Health Care Campus, Haifa, Israel (MM); Care Vision Laser Centers, Tel-Aviv, Israel (VS, TS, GM); and Barzilai Medical Centre, Ashkelon, Israel (IK).